Technically Severus was in a same room as all the screaming, but his mind wasn't. Inside his thoughts, he was enjoying a walk near the edge of the Forbidden Forest, just before dawn when the frost crackled under his bare feet and there was only the slightest hint of rose in the sky. "Disassociation." That's what the textbook that Severus had bought from a second-hand book store in Edinburgh described it as. Initially he'd been quite pleased when he'd discovered it. It was a thing. A real thing. There was a brief glorious moment of relief. He wasn't going mad after all. Then he'd kept reading the paragraphs, discovering that it was a defence mechanism, particularly common in individuals who had grown up in dysfunctional or violent homes. Severus had frowned when he read that part and had thought about the monster at Spinner's End. He obviously hadn't gone to the Forbidden Forest as a child. He'd gone to different places. Once he'd met Lily, he'd gone to her house a bit when things got really bad, even though he only went twice in person. He hadn't gone away as much at Hogwarts at first, but then the Potter and Black thing had got really bad, and sometimes he couldn't help it. Since the return of the Dark Lord, Severus had tried not to go away at all. 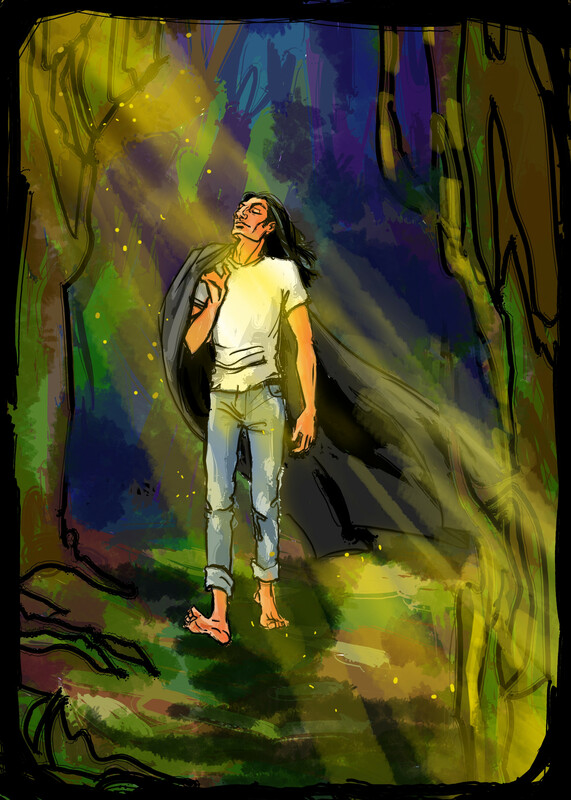 He needed to stay present and vigilant, which was impossible if he was off, virtually frolicking in the forest. Constant Vigilance… Wasn't that what Moody had always said? When Severus had been called from Hogwarts earlier that night, the intensity of the Summons had been the first warning, and the churning feeling in his stomach had been the second. He'd arrived to find a quorum of Death Eaters gathered in the Manor's ballroom. He'd made his greeting to the Dark Lord with a deferential bow, and had caught his eye briefly as he straightened up. That had been the third warning. Some twenty or so years ago, Severus had first met Riddle, and he'd been somewhat surprised at the experience. He'd expected a zealot, a version of Grindelwald. Not the handsome middle-aged man with the odd eyes. And Riddle's ideas. Well. It all had seemed so sensible at the time. In Severus's experience, Muggles were jealous of magic. Look at Petunia. At his father. Riddle did have a point after all. Muggles had done fairly badly at running the world. There was poverty, war, and disease. If those with magic took control instead of the Muggles, then these afflictions Muggles brought upon themselves could be cured. Of course Riddle also offered recognition, power… protection, things which Severus needed in spades. Severus had even thought Lily might agree with him, given her own experiences, but she hadn't. She hadn't at all. She'd disagreed violently. The others—Black, Potter, and the like—had said Riddle was a monster. Younger Severus couldn't understand why they couldn't see what he did. Riddle wasn't the monster—Voldemort was—but gradually Voldemort controlled the body more and more until finally he became the Dark Lord. The man who'd carefully laid out plans to save Muggles from themselves was suppressed, and Severus didn't see him much anymore. But unlike Lucius, McNair, Rookwood, and the others, Severus could tell the difference between Voldemort and Riddle. He thought he could probably thank his father for that. Severus's mind returned to the present and the moment that he had stood up from the slight genuflection. He'd met the eye of the Dark Lord, and in the depths of the red irises, there was no flicker of Riddle in there. When the Dark Lord began questioning followers on the whereabouts of Potter in a low, soft voice, Severus let himself fade quietly into the background. He watched dispassionately as those who pushed forward with eagerness were cut down in front of his eyes, followed closely by the stalwart followers like Rookwood, who tried to offer guidance. Severus remained mute. He stood silently until the Dark Lord spun on his heels in disgust and strode away from the gasps of pain he'd left behind him. Severus's stomach tightened and he stepped forward. Voldemort turned towards him. "Severus. What is it?" "I do not wish to waste your time; however, I feel that perhaps there is more I could be doing at Hogwarts," Severus began. "Is that so?" Voldemort asked smoothly. "I believe that the remains of the Order will continue to resist you, and I must seek out talented students to join us," Severus said. Voldemort glanced away momentarily and Severus stared blankly ahead. "Yes. I am certainly seeking some new blood," Voldemort said. "Particularly when I have had such… disappointments lately." "My Lord, I shall attend to this immediately," Severus said, and he inclined his head deferentially. "You may leave," Voldemort said. Severus nodded and left the room, stepping over his fellow Death Eaters who lay on the floor, moaning in agony. He didn't look back as he walked through the doorway, even though he could feel his back crawling with people's desperate stares. Knowing the right thing to say at the right time is very good, Severus's mind reminded him in his father's voice. It was late when he returned to the castle, and he decided to patrol before he retired to bed. He was too wired to sleep, but it was also a good opportunity to make sure the Carrows weren't up to anything horrible he wasn't already aware of. He strode along the empty dark halls, absentmindedly listening to his footsteps echoing loudly as he walked. It was a comforting, rhythmic sound. He could hardly see himself in the darkness as he hadn't bothered to light his wand, and his black robes melded into the darkness. As he walked Severus let his mind wander back to the Manor and to his dispassionate reaction to the violence in front of him. Sometimes he felt life was like watching things through a cloudy window. When things got really bad, or stressful and he couldn't go away, it was like someone offered him a helping hand. When he had to be the Death Eater. When he had to be the Headmaster. They could deal with those situations in a way that Severus could not. That part of him was cold, angry and numb and fit in perfectly with Lucius and Bellatrix. That part of him could sit calmly while a friend begged for her life in front of him before being eaten alive. That part of him could cast the Killing Curse at an old, injured wizard without hesitation. Stress brought that part out more than anything. Severus didn't like The Death Eater...The Headmaster...but he was useful. Severus came across Gideon Wellington approximately one hundred feet from the Hogwarts kitchens. He saw the Hufflepuff first year before the boy saw him. Severus swore internally. Confounded idiots! What would possess the child to wander the halls after curfew with the Carrows out for blood every night? He felt a prickly-hot rush of anger at the child for putting himself in such a position. For being found. And for creating trouble for Severus. "And exactly what are you doing out of your dormitory out of curfew, Mister Wellington?" Severus asked in a low, dangerous voice. Mister Wellington turned around and Severus saw he was holding a mug of what appeared to be hot cocoa. "I'm sorry, Headmaster… I was… I had a nightmare… I was scared," stammered the boy. Severus moved closer to the boy and stared down at him balefully. Couldn't the boy see how much harder he was making it for Severus? How could he keep everyone safe when they were all so stupid? Didn't they care at all? Selfish, selfish children. "You were so scared you decided to flagrantly break curfew and wander the halls of Hogwarts at night?" Severus asked. He could almost feel the vein in his forehead throbbing. "No, Sir," whispered the boy as his eyes filled with tears. "At home when I'm scared, my mum makes me cocoa. I thought it would help." "Get back to your common room immediately," ordered Severus. "You have lost your house fifty points, and you should be thankful it is not worse than that." He leant over the boy further and noticed something in the gloom. The faintly lit sconce on the opposite wall barely emitted enough light to see by, but Severus could see the dark stain on the floor under the boy's feet. Disgusting, Severus thought angrily, looking away. He caught a movement in the corner of his peripheral vision and for one, terrible heart-clenching moment he saw his father across from him, and he could see he was all monster. There was no da at all. 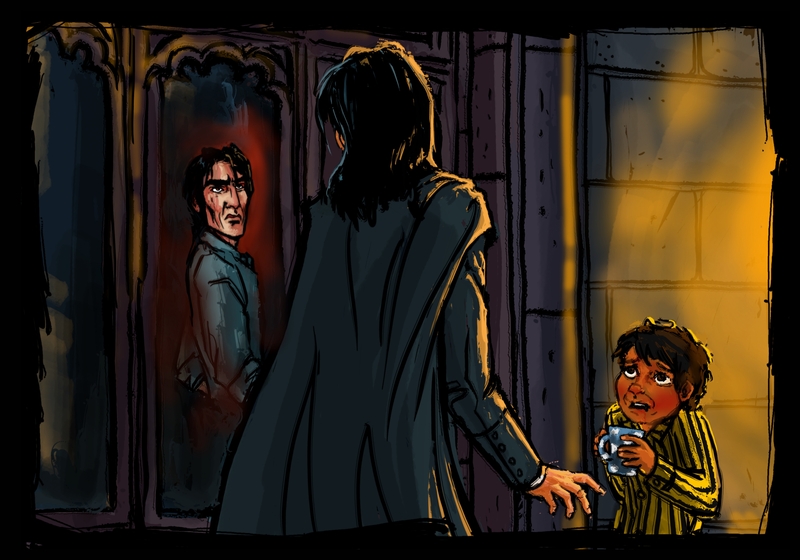 Severus suddenly realised he was looking at his own reflection in a castle window. He pulled himself abruptly upright as the anger drained from him in an instance, replaced by a dull sickness. "Obliviate," Severus almost whispered, and Mister Wellington's eyes briefly glazed over. Severus redirected the boy in the direction of the Hufflepuff common room, and sent him on his way after a Cleansing Charm. He stood in the corridor and watched the small figure depart. 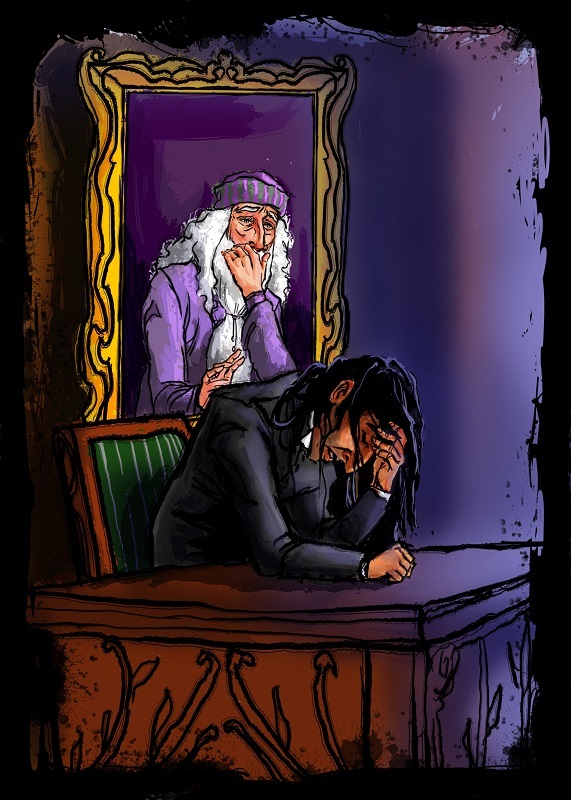 When he could no longer see the boy, Severus returned to the Headmaster's office.